CR7 by Cristiano Ronaldo is an aromatic fougere fragrance for men. Cristiano Ronaldo dos Santos Aveiro started his football career at the age of 16, fast forward 2 decades and he is now one of the highest paid sportsmen in the world, with his own clothes brand, hotel and a fragrance line. CR7 is his third fragrance following the successful Legacy and Legacy Private Edition. The opening will draw you in with a spicy blend of bergamot, cardamom and lavander. Follow the heart of cinnamon and cedar and you are left with a warm, masculine aroma with hints of vanilla and woods. This is a must-have accessory for the sporty man; it also comes in fun gift sets as body spray, deodorant, shower gel and more. CR7 was launched by Cristiano Ronaldo in 2017. 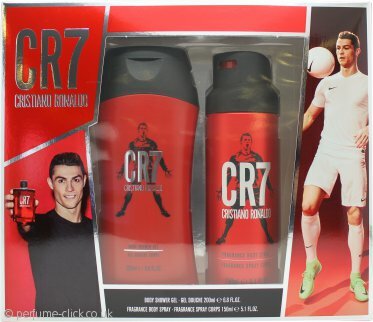 Cristiano Ronaldo CR7 Gift Set 200ml Shower Gel + 150ml Body SprayQuality and Price great! Quick delivery and product looks more expensive than it actually cost! My teenage son was very happy! Bought as an extra Christmas present for our football mad son. He was delighted with it and has already asked if we could get him some more. Extremely good value and went down well considered it was a surprise stocking filler.